Hue deserves to be a poetic and romantic city with images of Hue charming girls in traditional dresses called "Ao Dai", beautiful Huong river streaming slowly in a windy afternoon and sweet Hue songs moving visitors' souls. 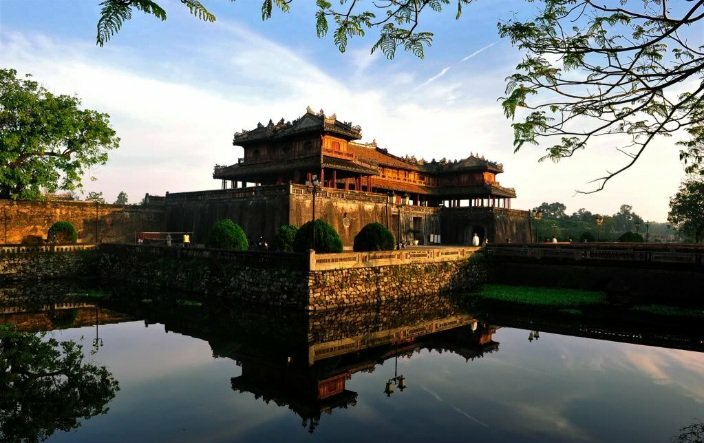 This citadel land not only attracts tourists with its stunning landscapes, ancient imperial palaces, history but also remark them in various culinary culture. Com Hen is truly a symbol of Hue cuisine when visiting here, everyone will recommend you to try this food. Even the dish is a rustic food that is cooked from simple ingredients such as old rice overnight, clam and broth added with spices and herbs, Com Hen is only special and gives you true taste in Hue. However, the process of preparation for this food is quite complicated. Baby clam from rivers will be soaked in rice water to remove dirt and seaweed then boiled to take clam inside and clam broth. Grains of old rice overnight has to be separated to increase flavors of other ingredients. A bowl of Com Hen is served with stir-fried clam, pork skin, roasted peanuts, pork floss, chilli, pepper and especially, fresh green vegetables (coriander, star fruit, banana flower and pineapple slices, etc). Besides, people also often add clam broth into the bowl to eat with rice. The mixture of many fresh ingredients makes the food more delicious and mouth watering to eaters, gives you all tastes of sour, salt, sweet of clam broth, hot, fat and fresh. It seems hearts, souls and friendliness of Hue people to visitors. Bun Bo Hue has been a traditional food of Hue locals for a long time. It is made from vermicelli noodles which are round thick compared to flat noodle of Pho Hanoi. The secret to make a bowl of delicious Bun Bo Hue is in ingredients selection and cooking broth. Hue people stew pork shank, citronella, red pepper to make broth. Each bowl will be served with a part of upper pork shank, beef, cubes of congealed pig blood and fresh vegetables such as bean sprouts, shredded banana flowers, basil, mint, lettuce, lime and so on. 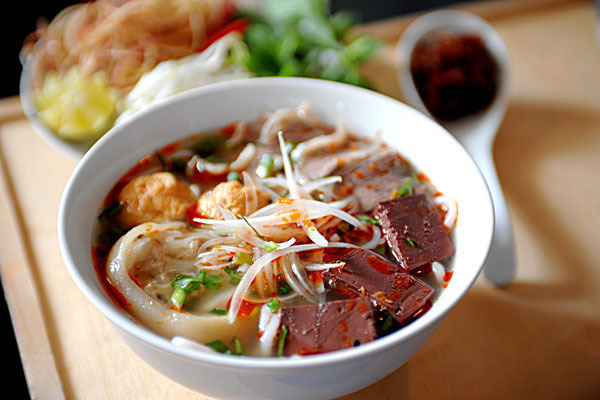 In Hue, people prefer spicy food, therefore, Bun Bo Hue is also added with a lot of chilli and pepper. 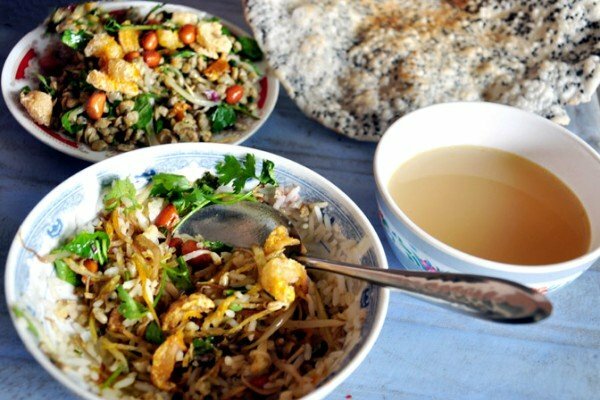 Banh beo is a popular dish for both locals and visitors in Hue because this food is really cheap, simple and you can easily taste it on a small stall on streets or from street vendors. 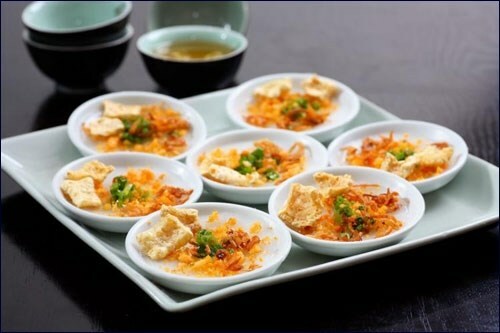 Banh beo includes two main parts: soft rice layers and fillings. Layers are made from rice powder mixed with water to create liquids and added with salt, oil then poured into small cups or bowls and steamed to be cooked. The oil will keep the layer from sticking to the bowl. After 10 or 15 minutes, people will top with shrimps, greaves and dried spring onions. People taste this food by dipping it in thin fish sauce mixed with fresh lime, sugar, chilli and garlic. Banh beo should be tried when it is till hot and kept original flavor of fresh shrimps, spicy taste of pepper and garlic floating in your mouth and gentle, soft of rice cake. It is such a huge missing for not listing "nem lui" as a special food in Hue cuisine. Nem lui is made from ground pork meat, pork skin sliced, grease marinated in salt, fish sauce, sugar, pepper and fermented. Then people will bamboo sticks to skew meat and grilled on coal stoves. 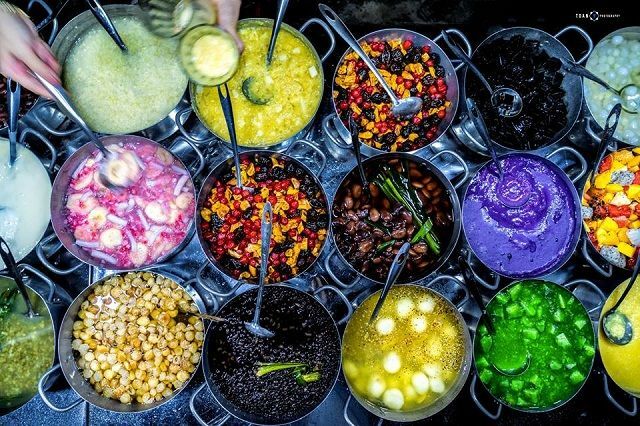 What makes the dish more attracting to foodies is dipping sauce that is made from ground peanuts with fish sauce, in somewhere people add with ground meat and organs to increase the flavor. 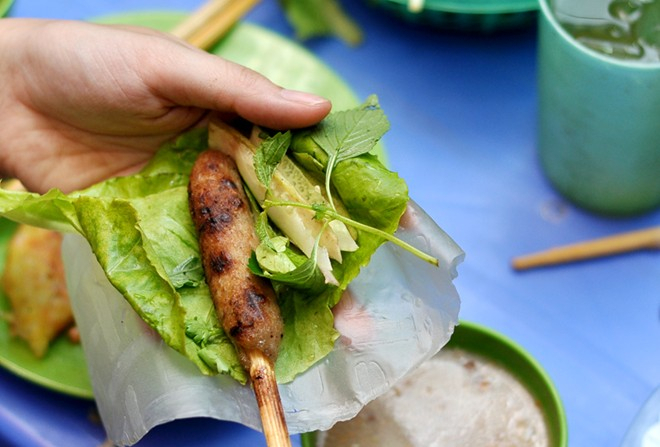 To enjoy the food in a right way, you have to spread rice paper (banh da nem) and put all kinds of fresh herbs (coriander, sour star fruit and green banana slices), nem lui inside and roll up to dip into sauce and taste it. The flavor of spices, marinated meat, delicious sauce and fresh vegetables created an unforgettable experience of savour in your life. It is true to say that Hue is a heaven of many kinds of sweet dessert soups. People will various types of ingredients such as lotus seeds, corn, grapefruit flower, green or red beans, taro, etc. 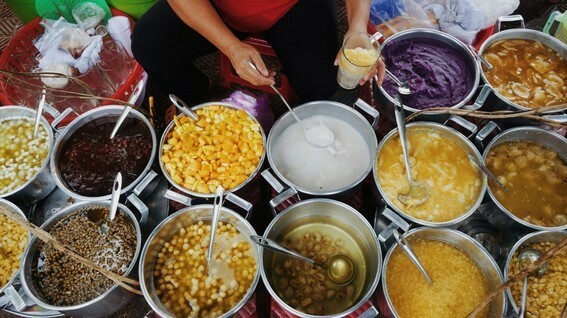 Sweet dessert soup in Hue is divided into two branches: royal sweet soup and street ones but both of them are prepared carefully and complicated to give eaters the best taste and flavor.